Liveshow is a show stopper. 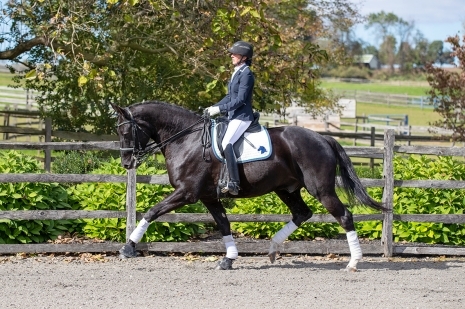 Solid black with chrome face and legs, this beautiful 2008 Hanoverian gelding (Likoto x Legat) is special. He’s flashy with three great gaits, is light in hand, easy off the aids, and a pleasure to ride. He has shown 4th Level in Wellington, FL, with scores in the mid-60s and is schooling piaffe, passage, pirouettes and one tempis. A very solid citizen, Liveshow has a sweet disposition and loves to hack out. Video available upon request. Prevetted and x-rays available. Contact us for more information and to schedule an appointment.